xiv+653 p., cloth, 1400 g.
A central issue of Egyptological research is the question of dating the original composition of religious or literary texts. Very prominent is a lively debate about the date of composition of a number of literary texts, traditionally dated to the Late First Intermediate Period or the Early Middle Kingdom but known only from New Kingdom manuscripts. Over the last years, several attempts have been made to date the production of some of these texts much closer to their fi rst physical appearance. More recently the discussion has heated up considerably with contributions that argue for a New Kingdom origin of Merikare, Neferti, and Amenemhet—a reassessment based on conceptions of Egyptian cultural history or on linguistic analysis. On the other hand, there is an equally strong tendency to retain at least the early datings or to propose even earlier ones for some literary and many more religious texts. Th is volume presents both overviews and in-depth case studies of current Egyptological dating practices and methods. 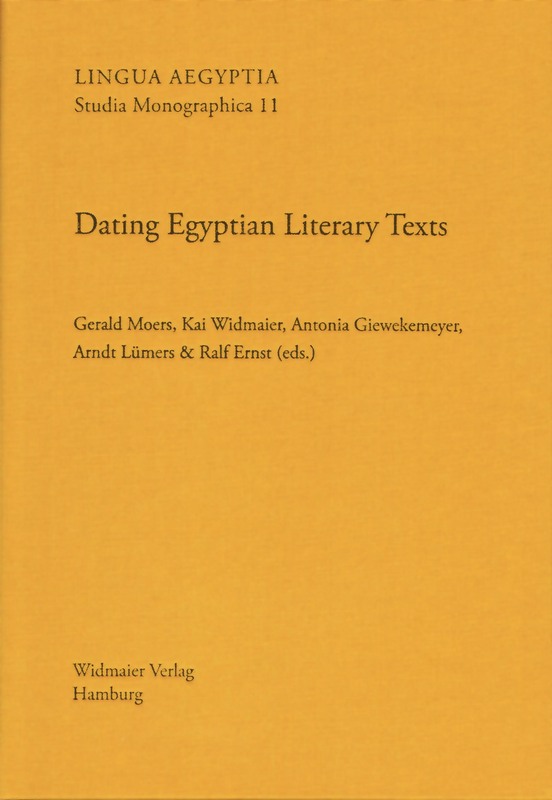 While giving the ‘state of the art’ of dating Egyptian literary texts, the book also addresses important methodological issues to provide a basis for future research. Getting involved with the debate on how to date the ‘original composition’ of those Egyptian pieces of ‘literature’ which are transmitted only in New Kingdom manuscripts but have traditionally been dated to the Middle Kingdom and especially to the earlier 12th dynasty is a high risk investment. At the moment, two positions are being taken which seem to be mutually exclusive not only because they use the same material for different arguments but most of all because implicitly, the Egyptologist’s object of inquiry is constructed in two entirely different manners, Egyptological philology thereby showing some interesting twists and turns when seen from a genealogical perspective. In fact, the genealogy of Egyptological philology leads directly into the heart of the discipline’s identity as well as it shows the hidden epistems of a rather historic practice of dealing with issues of textuality and meaning, including the dating of texts. It was not until very recently that the broader discussion on how to work with ‘literary texts’ of insecure origins and historical contexts, by now known as the ‘re-dating hypothesis’, has also triggered deeper questions on the methodological standards involved in our accustomed philological practice (§ 1). Traditionally, Egyptological philology was used to construct its objects in terms of ‘texts’ of individual origin, deeply endowed with a unifying authorial intention. However, as becomes strikingly evident for example in Georges Posener’s Littérature et politique, the resulting ‘author-text’ can be shown as a result of an unrecognized combination of the romantic, author-centered parts of Lachmannian philology and literary formalism (especially ‘New Criticism’). From a versionist point of view, this ‘text’ is but a clear example of what David Greetham has termed a “text that never was”, a philological fiction which is highly questionable to suit the realities of the Egyptian manuscript culture (§ 2). Just as problematic is the practice to take these reified ‘texts’ as a datable point of departure for linear, rather teleological models of literary, linguistic and palaeographical change. In fact, these models are based on an equally unrecognised epistem of ‘style’ which is again fundamentally modern and thus inappropriate to describe the use of ‘style’ in Ancient Egypt in general and also for dating purposes (§ 3). As it seems, rather versionist approaches that take into account the fragmented density of the Egyptian ‘literary’ culture seem to be more appropriate as a model of Egyptological textual scholarship (§ 4). This might also have consequences for “Dating Egyptian Literary Texts”. One of the basics for analysing Middle Kingdom literary texts is their physical availability. This simple statement is important for the present discussion. The first step consists of a brief overview of the contexts of discovery of the texts on papyri (tombs versus settlements; primary sources). The owners are thus identified and linked with social groups. The available information on the provenance and distribution of literary papyri suggests that during the Middle Kingdom these texts were mainly distributed locally rather than countrywide. The second step includes the presentation of the secondary sources, mainly the complete text on the stela of Sehetepibre from Abydos, the intertextual reference in a graffito and in a tomb inscription. Using Sinuhe as an example, the ways and problems of transmission of literary texts are described. The latter include „Fundzufall“, which is often taken as an argument for the lack of literary texts of which no Middle Kingdom manuscripts are extant. It becomes clear that „Fundzufall“ can only be used with a clear definition of the term. In conclusion, intentional (knowledge from lists) and unintentional transmission (intertextuality) as means for validating the existing corpus of literary texts during the Middle Kingdom are discussed. Although texts written in Middle Egyptian were apparently much valued as examples of high quality belles lettres during the Ramesside Period, they were also employed extensively for didactic purposes in scribal training as well. The most used of these texts was the Kemyt, a text that was strikingly different from the other Middle Egyptian texts because of its archaizing script and columnar format. By trying to assess what the didactic aims of this odd work might have been, we can better understand the Sitz im Leben of the seemingly obsolete Middle Egyptian dialect during the Ramesside Period and its practical value for the scribes of Deir el-Medina. The materiality of the manuscripts is a significant factor in assessing the date of the Middle Kingdom poetic corpus, and needs to be interpreted within the context of the chances of preservation. A reassessment is offered of the model proposed in Poetry and Culture in Ancient Egypt in the light of the suggested re-dating of much of the corpus; the general outlines of the model are found to be largely unaffected. Some subjective reflections are offered on what the re-dating hypothesis might reveal about our present academic attitudes toward the study of Ancient Egyptian literature and also on the possibilities that the hypothesis opens up for engaged and historicised approaches to these texts and their receptions. The paper presents insight into the corpus of hieratic graffiti in the 2005 discovered tomb N13.1 in the Gebel Asyut al-gharbi in Middle Egypt. The owner of this rock tomb lived at the very end of the First Intermediate Period, while the first graffiti seem to be written at the very beginning of the 18th dynasty, and the latest at the end of the 20th dynasty. Beside many graffiti with visitors’ formulae, more than twenty texts are copying famous literary works. The context of literature fixed on tomb walls of the past, which is singular for Egypt until now, and the date of the earliest handwritings may be of some interest for the theme of the conference. Why Should We Date Texts by Historic Linguistic Dating? Assigning a date for the original composition of a text is of vital importance, yet the methods used for such a dating differ widely. In this paper, historic linguistic dating is advocated. This method relies mainly on grammatical features which can betray the stage of the language used and thus the period of composition. The reasons for its applicability are discussed. It is demonstrated by examples from late temple texts that the commonly held assumption that such texts were and had to be written in a deliberately archaizing sacred “Neo-Middle-Egyptian” is not corroborated by the actual evidence. By extension, the same holds true for the older periods as well. Analyzing the choice of words can help to determine the date of a composition. But this method is less prevalent among Egyptologists than the evaluation of the morphology of verb forms. In this paper I shall discuss some lexical approaches to dating Egyptian texts in order to demonstrate their advantages on the one hand and, on the other hand, the problems that may arise when applying them. I want to adopt a method developed for information retrieval, the vector space model. Applying this model, texts are transferred to document vectors. The angle between two vectors is a measure of similarity: the smaller the angle, the more similar the documents. After the measurement of the similarity between all literary texts, document clusters should be recognizable on the basis of their similarity. Finally I shall evaluate the cluster of literary texts by analyzing the factors which generate lexical similarity. Scanning the idiolect of the Teaching of Amenemope seems the safest way to get some clues about its date. While this idiolect obviously reflects the fundamentals of late Egyptian in the widest meaning of the term, it also offers features that suggest its being somewhat out of the ordinary. To assess these features, we should be aware that the teaching was consciously conceived as a work of literature beyond the didactic aim inherent to its form. On the one hand, this literary premeditation entails implementing lexemes or grammatical constructions (#nfr Substantive# pattern without cataphoric se) that are clearly recessive from a standard ramessid late Egyptian perspective. Moreover, the strong intertextuality involved in the teaching enhances the recessive pressure on the text and accounts for the sporadic appearance of unexpected elements (sdm-n=f ; tm heading an apodosis). Now, on the other hand, there are many phonetic lexical and grammatical features that can be undoubtedly classified as evolutive, because of their trajectory within Egyptian language. Most of them are first attested in the late Ramessid Period and become more or less regular in later stages, pre-demotic late egyptian, demotic, late period «égyptien de tradition», coptic. It should be emphasized that the idiolect of the Teaching of Amenemope shares some of these features with the Wermay Letter, with the Story of Wenamun, with Twenty-first Dynasty letters (LRL; so called El-Hiba archives), with religious texts of the Third Intermediate Period (Amuletic decrees; supplementary chapters of Book of the Dead). The systematic use of the third future with preformant r before a noun subject turns out to be of paramount importance for assessing the idiolect of the Teaching of Amenemope. This idiolect substantiates not only a stage of language a little bit more advanced than the standard ramessid late egyptian, but also the possible influence of a particular dialect that could be surviving in the coptic akhmimic dialect. In an annex, a detailed treatment is devoted to the compound prepositions r(/m)-D#w.t and r(/m)-d#r. This contribution first reviews linguistic features that have been put forward as arguments for an Old Kingdom date of particular theological compositions first attested in the New Kingdom: the Netherworld Books (Amduat, Book of Gates, Book of Caverns, Book of the Night, Books of the Earth), the Book of the Day, the Book of Nut, as well as the Litany of the Sun. In this context, the adverbial use of jwt/jwtj, the proclitic use of determiners (pn NP), the attestation of ‘old prospective’ forms (sDm.w=f, nj sDm.w=f, sDmm=f, nj sDmm=f), the lack of certain periphrastic tempora (jw=f r sDm, jw=f Hr sDm), the proclitic pronoun construction sw sDm=f, and the nominal sentences with Twt (js) and swt (js) are discussed in some detail. The review concludes that it is indeed plausible to date at least some of these compositions as attested in the New Kingdom to the New Kingdom (or to the Second Intermediate Period), testifying to the profound philological and linguistic competence of certain Egyptian literates at that time. Therefore, besides the Urkunden IV and some medical texts, the Netherworld Books can serve as another landmark for the linguistic dating of pieces of literature attested not earlier than in the New Kingdom. Egyptian literary texts have been used in several different ways as historical sources. Due to the uncertain relation between fictionality and factuality in literary texts, this approach is problematic already in itself and must be followed with utmost caution. The attempt to obtain valid historical data from literary texts becomes even more problematic if their exact date of production is entirely unknown. Nevertheless, owing to the comparatively small amount of securely dated written sources, several literary texts have been used for a reconstruction of specific events and political concepts of the early 12th dynasty, even though the earliest known manuscripts date to a period 400 years later. In the present contribution I argue on methodological grounds (see § 2) that (1) any historical reconstruction based on insecurely dated Middle Egyptian literary texts should be abandoned and that (2) their usage as historical sources should be limited to those periods, during which their transmission is securely attested. Therefore it becomes necessary (1) to analyse to what extent common reconstructions of the Early Middle Kingdom have to be reconsidered and (2) to examine what kind of information can be obtained from the proven reception and transmission of several Middle Egyptian literary texts in the Early New Kingdom. Using The Words of Neferti as a case study, both these points are treated in the present study. Based on these grounds, it challenges far-reaching historical conclusions deduced from literary texts and aims at a realistic evaluation to what extent these sources provide (us with) historical data. The first part (§ 3 & 4) is concerned with the question how the usage of The Words of Neferti as a historical source of the early 12th dynasty affected and still affects the historical reconstruction of the reign of Amenemhat I. In this context a specific focus lies on the propagandistic reading of Neferti that was brought forward by Adriaan de Buck and Georges Posener (see § 3.1 & 3.2) and that fundamentally changed the usage of Neferti as a historical source. Based on the propaganda model it was not only presumed, that Amenemhat I. was in a precarious situation, when he ascended the throne, but also that he presented himself as a saviour-king. Furthermore, the propagandistic reading of Neferti was and is used today as a means to reconstruct, for the time of Amenemhat I and Senwosret I, the intention to emphasize a break with the past and to dissociate their reigns from the First Intermediate Period while affiliating it with the Old Kingdom (see § 3.3). As shown in § 3.3.2, this interpretation is not only problematic because of Neferti’s uncertain date of composition, but furthermore, because it is by no means provable that the text refers to the First Intermediate Period and/or to the Old Kingdom. Nevertheless, this assumption as well as the interpretation of the text as a means to stress a break with the past heavily influenced the interpretation of the choice of the name wHm msw.t by Amenemhat I that was henceforth generally interpreted in the very same way. But as a matter of fact this widely accepted assumption cannot be validated by a study of the different uses of the term, which shows that it stresses not a break, but continuity (see § 3.4). Especially due to this fact it becomes apparent that without the usage of Neferti as a historical source of the early 12th dynasty there is nothing that indicates a contemporaneous propagation of Amenemhat I as saviour-king, a presentation of his reign as a caesura or a specific periodisation and appraisal of the past. In this respect, it can be seen that abandoning the common historical usage of the Middle Egyptian literary texts of uncertain production dates renders a thorough reappraisal of the common reconstruction of the Middle Kingdom necessary. This becomes also obvious in § 4 which deals with Andrea Gnirs’ reading of Neferti as a product of the New Kingdom and discusses her subsequent usage of the text as a direct historical source of this period. For in this context it is pointed out that even Gnirs’ reading of the text partly depends on the very image of the early 12th dynasty, that has been derived from the common dating and interpretation which had been rejected by Gnirs herself. This reveals how even attempts of redating the literary texts in question might be potentially (albeit unintentionally) affected by the common dating of these texts into the Middle Kingdom. And in a more general way, this shows the complexity of the problems inherent in the use of insecurely dated literary texts as direct historical sources for a certain period. In its second part (§ 5) the paper treats the question to what extent the proven transmission of Neferti in the early New Kingdom offers certain historical insights. In this respect, I argue that the texts provide mainly indirect information such as indications for one possible interpretation of phases of Inner Egyptian fights as well as indications for a retrospective view on the time of Snofru. By contrast, it cannot be used to reconstruct a certain retrospective image of the First Intermediate Period, because a reference to this time cannot be assured. Furthermore, even a reference to the reign of Amenemhat I is far from being certain, as an identification of Ameni with this king is only one among many other possibilities. Geschichte und Literatur. Wie „historisch“ sind ägyptische literarische Texte? In the present paper, ancient Egyptian literature is looked at from a historian’s perspective. Since traditional philology still displays the tendency to largely neglect theoretical approaches, one needs to consider its historical self-perception against the background of postmodern textual analysis as it is developed especially in the field of medieval studies. Attention is devoted to the analytic and interpretive procedures of new philology, which emphasize the material aspects of the manuscript and the historical situation of its production and proceed from the concepts of textual variance and réécriture. As a case study, the history of transmission of the tale of Sinuhe shows that profound textual modifications took place during the early New Kingdom also on the thematic level, transforming the text into a different tale from the one related by Middle Kingdom manuscripts. The timing of Sinuhe’s réécriture coincides with the appearance of some compositions usually considered an essential part of classical literature of the Middle Kingdom and may testify to a phase of literary creativity during which classical texts were rewritten and new poems paying tribute to the old tradition were composed. From the point of view of historical linguistics and textual criticism, the most promising perspectives come from a typological approach that does not try to strip layers of different language registers from an allegedly “ideal” Middle-Egyptian, but rather considers actual texts as reflexions of a specific datable period in the evolution of the written language. It privileges a model in which the past is seen as an ever-changing continuum and not as a sequence of ever-returning, monolithic phases. By regularly dating texts as early as possible, the latter approach tends to over-interpret the Middle Kingdom as the formative phase of ancient Egyptian culture. A similar tendency characterizes some new historicist studies of Egyptian literature, which indulge in a synchronic, rather than diachronic reading of history. The present paper argues against a hierarchical reading of literary genres which prioritizes fiction over historiography. It also pleads in favour of a broad use of history in literary studies. Die Ansätze zur Datierung der älteren ägyptischen Literatur lassen sich nach einer pionierhaften Zeit grob in drei wesentliche Phasen unterteilen. Die erste definiert das Corpus; hier werden etliche Werke ins Alte Reich oder die Erste Zwischenzeit gesetzt, kein in mittelägyptischer Sprache verfaßtes Werk später als das Mittlere Reich angesetzt. In der zweiten Phase zweifelt man an der Existenz von literarischen Werken im Alten Reich und der Ersten Zwischenzeit. Die dritte tendiert dazu, alle nicht in Kopien des Mittleren Reiches erhaltenen Werke erst später anzusetzen. Hinsichtlich der vorgetragenen Argumente wird hier eine Klassifizierung in Argumente nach der Materialität der Textträger, nach formalen Aspekten und nach inhaltlichen Aspekten des Textes versucht. Die verschiedenen Kriterien werden an Beispielen auf ihre Tragfähigkeit und Beweiskraft getestet. Dabei zeigt sich, daß insbesondere die aktuelle Tendenz zur Spätdatierung vieler Werke kaum durchschlagende Gründe hat und nach den materiellen Aspekten der Textträger sogar sehr unwahrscheinlich ist. After a pioneering time, three phases of scholarly discussion about the date of the older Egyptian literature can be distinguished. The first one defines the corpus; a number of compositions are attributed to the Old Kingdom and First Intermediate Period. No literary composition in Middle-Egyptian language is dated later than the Middle Kingdom. The second phase is marked by doubts about the real existences of literary compositions in the Old Kingdom and First Intermediate Period. The third phase tends to propose late dates for all compositions not positively attested in Middle Kingdom copies. A classification of the arguments is proposed here, distinguishing between those from materiality, from formal aspects and from content. The different criteria are checked on select examples for their quality and reliability. The outcome is that the current trend for late dates has hardly any positive proofs and is facing serious problems especially from the side of materiality. The Hymn to Hapi is usually dated to the Middle Kingdom for a number of reasons. Firstly, because the text was popular as a writing exercise in 19th and 20th-Dynasty scribal schools; secondly, because it has been passed down in some manuscripts that also include other supposed Middle Kingdom popular literary works attributed to the well-known Middle Kingdom writer Kheti; and thirdly, because of the supposed royal propagandistic content of the hymn. However, the transmission history of the text, its formal structure, liturgical theological content and some linguistic details offer cumulative strong evidence that support the hypothesis that this poem originally dates to the early 18th dynasty. 1.2 Die Schule als Sitz im Leben? 3.4 Gesellschaftlicher Wandel im Neuen Reich: Nur ein Produkt der Überlieferungslage? The Teaching of Khety belongs to the most copied Egyptian literary texts, and it is widely accepted to be one of the ‘Middle Kingdom classics’ although the earliest preserved copy of the text can be dated to the 18th Dynasty. Since the teaching emphasises the value of the scribal profession in contrast to the misfortunes of the trades, it is generally regarded as a teaching tool of the 12th Dynasty and the majority of scholars considers the Teaching of Khety to be part of the Middle Kingdom’s school curriculum. However, closer examination reveals that the unanimous agreement about the Middle Kingdom dating of the Teaching of Khety is grounded on Egyptological tradition rather than on independent evidence or arguments deriving from contemporary contexts (§ 1). In view of the lack of convincing evidence for an early dating this paper dissociates the Teaching of Khety from its hypothetical but hitherto unquestioned Middle Kingdom context and rereads the text within the context of the New Kingdom. By this means it focuses not only on (the period of) the preserved manuscripts but also on Deir el-Medina in particular as their main findspot (§ 2). The paper reconsiders thus the issue of the so-called scribal exercises as well as the school of Deir el-Medina by paying attention to the writers of the vast majority of the preserved manuscripts. Because of their role in the process of text transmission the inhabitants of Deir el-Medina are to be regarded as an ancient audience which provides enough evidence for a certain contextualisation of the teaching: in Deir el-Medina craftsmen were reading the teaching, i.e. a text which outlines a particular perspective on the life of craftsmen. Surprisingly, up to now this obvious fact has only rarely been incorporated into Egyptological interpretations of the text. Therefore this contribution also deals with sculptors in the New Kingdom as one of the professions present both in the teaching’s audience of Deir el-Medina and in the teaching itself (§ 3): the situation of sculptors in Amarna (§ 3.1) and New Kingdom evidence pointing to a relatively high degree of mobility for at least some craftsmen (§ 3.2) is taken into account. And the study also includes some contemporary images of professions attested in visual media (§ 3.3) in order to achieve a more adequate interpretation of the text and its content within a context contemporary to the vast majority of the known manuscripts. Regarding the limited evidence and the chance of preservation the possibilities of using arguments from ignorance (arguments ex silentio/ad ignorantiam) are reconsidered (§ 3.4). The new reading of the teaching hereby suggested does not argue for a dating of the text to the New Kingdom but points towards the necessity of new strategies to contextualise literary texts which have so far only been preserved by manuscripts derived from their New Kingdom audience. Along these lines, the Teaching of Khety is discussed in the context of New Kingdom discourses on professions and the selfperception of literate craftsmen in Deir el-Medina (§ 4). Wolfram von Eschenbach’s Parzival is a German courtly romance composed shortly after 1200. In the Parzival-project based at the University of Berne, a new critical edition of the poem in electronic and printed form is being prepared. It visualizes parallel textual versions, which, depending on particular circumstances of oral performance, have developed in the early stage of the textual transmission. Philological research as well as phylogenetic techniques common in the natural sciences, e.g. in molecular biology, are used to demonstrate the existence of these early textual versions. The article shows how both methods work and how they are applied to the ongoing edition. Exemplary passages to be presented will include the text of some rare fragments that were written in the first decades of the 13th century; they might even have originated in the author’s lifetime and thus allow to date the existence of the versions they belong to. Since Gardiner’s publication of the Admonitions in 1909, the troubled times reflected in the text was assumed to be the end of the Old Kingdom or the First Intermediate Period. My critical reappraisal of the social and historical setting in 1964, however, demonstrated that the terminology used for foreigners and slaves, and references to social institutions, foreign relations and the political control of Lower Egypt, all pointed to the time of the late 13th Dynasty as its true socio-historical setting. These same methods of historical criticism have also been used to re-date the composition of the biblical narratives of the patriarchs in Genesis, the Israelites’ sojourn in Egypt and the exodus, and the stories of David, to a much later period than had been previously suggested. We know little about the circumstances which gave rise to the composition of biblical texts, except what they themselves choose to tell us, and there is much debate about their dates and origins. They not only furnish a salutary example, however, of the many problems involved in trying to pin down the date of ancient texts, but also emphasize the need to consider such texts against a broader background. They are not necessarily simple products of single contexts, but may be used and re-used across long periods, with different circumstances potentially providing new contexts and new uses. Ultimately, there is more to texts than their date of composition, and it would be a mistake to rely wholly on theories of origin as a key to interpretation of meaning.